SAN FRANCISCO (AP) — Google's voice-activated assistant can now recognize who's talking to it on Google's Home speaker. Distinguishing voices will allow Home to be more personal in some of its responses, depending on who triggers the assistant with the phrase, "OK Google" or "Hey Google." For instance, once Home is trained to recognize a user named Joe, the assistant will automatically be able to tell him what traffic is like on his commute, list events on his daily calendar or even play his favorite songs. Then another user named Jane could get similar information from Home, but customized for her. The ability to distinguish voices may help Home siphon sales from Amazon.com's Echo, a competing product that features its own voice-activated assistant, Alexa. The Echo doesn't yet recognize different voices. Instead, it has a feature that allows Alexa to switch to a different account when told to do so. The Echo can only handle two personal accounts. 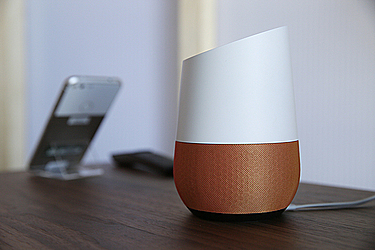 Google's voice-distinction feature, however, won't prevent unauthorized users from activating the assistant, as long as Home's microphone is turned on. That loophole allowed Burger King to recently air a TV commercial that included the phrase "OK Google" to prompt Home's assistant to recite the ingredients of the fast-food restaurant's Whopper burger from a Wikipedia entry. Google quickly blocked Burger King's commercial from toying with the Home assistant, but the marketing stunt illustrated how the technology can be manipulated. Voice-personalization eventually could enable Home's users to block others from accessing the device, but Google isn't ready to do that yet. "It's important to balance making sure the assistant on Google Home is still useful and able to answer a guest's or friend's question while also answering a few specific questions just for you," Google spokeswoman Kara Stockton said. The voice-distinction feature also isn't being offered for the same digital assistant that operates on Google's Pixel phone and other smartphones running on the latest version of its Android software. Google doesn't think the technology is necessary on phones because most of those devices are password-protected and are usually used by just one person.